Cinnamon, a former coworker of mine, started making dolls over two years ago. She works out of her Bronx one-bedroom at night, after coming home from her full-time graphic design job. 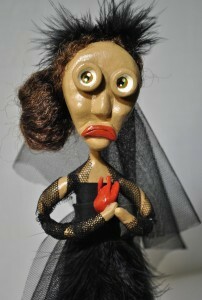 I first saw her dolls in person this month, at the opening night of MF Gallery’s annual Toys Show. (Cinnamon arrived late, having spent the afternoon manning a table at a six-hour craft fair in Harlem, before returning her crafts to the Bronx and then heading to Brooklyn for the show.) The appointment-only exhibit is up through Dec. 23 and full of twisted toys that Tim Burton could have commissioned; I especially liked the Frankenstein-esque paper dolls pieced together from pictures of other people, like photographic ransom notes. Last weekend, I met Cinnamon in the East Village to discuss how she deals with gallery costs, why she hasn’t sold more of her dolls yet, why Etsy has its drawbacks and how she balances her passion with paying her bills. 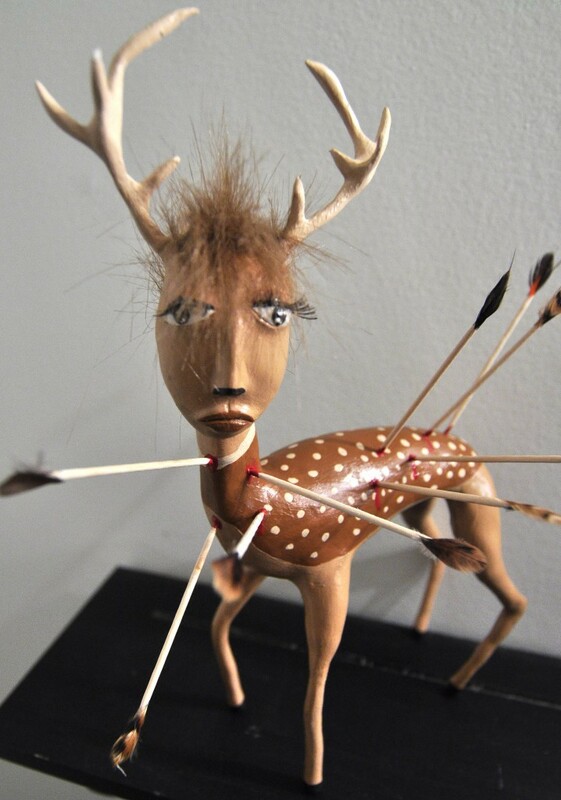 Can you start off by telling me a little bit about how you started making these dolls? It was August 2010. I saw a doll online and went, wow, that doll looks really sad. And I wanted to buy it; then I saw it was maybe $500, and I’m like, I’m not spending $500 — I don’t have $500 to spend on it. 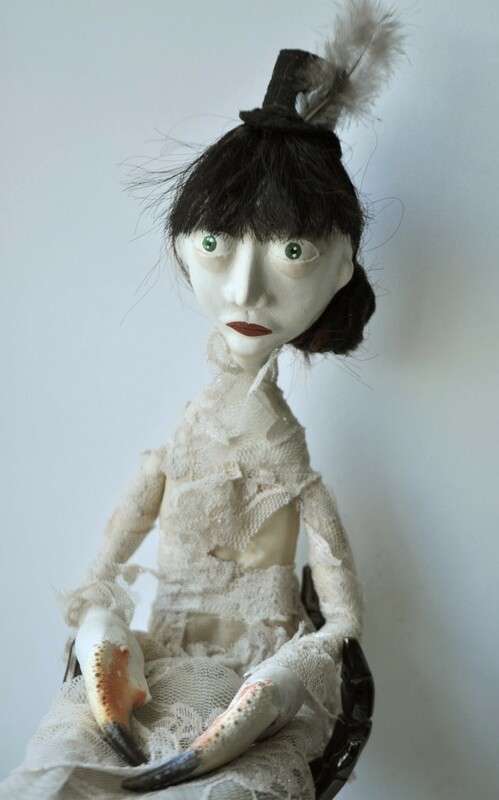 … I said, well, maybe I could start making some sad dolls, or something with the same kind of feel, and that’s pretty much how I started. I just emulated what I saw. Once you knew you wanted to do that, how did you go about deciding, “This is how I’m going to make them,” and “These are the materials I’m going to use”? I’m still figuring it out. Like, I’m still trying to figure out what kind of clay to use, because I had oven-bake clay, and I was just really testing a lot of different kinds of things, and I just realized that certain things don’t work, while others do. So now I’m using air-dried clay and it doesn’t break as often as the oven-bake clay. And then whatever else is pretty much in the house. I’ll have random clothes that I don’t want anymore, and cut them up. Sometimes I’ll go to the fabric store and buy some fabrics, but a lot of the time I’ll end up using stuff that I have. And I’m always in the hair-supply store because I’ve got to get hair — I don’t have that stuff just lying around! You’ve said you have a lot of dollmaker friends on Facebook–did you know other people who made dolls before you started doing this? Absolutely not. I made a totally different Facebook [profile] just to find dollmaker friends, because I wanted it to be a separate identity from me. So I just started seeking out people, and after I started putting pictures up of my dolls, people started requesting me. I’m up to maybe 1,100 friends now, and the majority of them are dollmakers. Do you feel like you get any sales or other opportunities through Facebook? I just use Facebook to really put the word out. I didn’t really put my dolls up for sale; I have maybe two dolls up for sale out of all the dolls I have, because I’m really trying to focus more on galleries now. How did you get into your first gallery? When I was speaking to those people on Facebook, I just asked them, “Hey, I see you’re in a lot of galleries, how did you get in?” Someone told me about MF Gallery, the one I’m in now [and in the same show last year]. She said, just email them some pictures, and they’ll probably get back to you and ask you for a doll. They’re pretty laid back. … There’s not a whole lot of red tape you’ve got to go through if you want to get into that gallery, it’s pretty straightforward, as long as it’s in their same style. 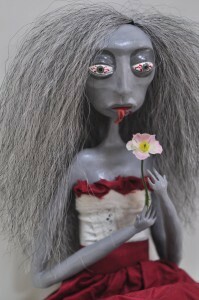 I have two different styles of dolls that I make — the ones I call the Misfits, because they’re a little dark, and then I have the really cute, sweet dolls. I would never send them a sweet doll. You kind of have to tailor your work to certain people. How many dolls have you sold so far? So you said you’re focusing on galleries now. The show last Saturday — do you put your dolls in that gallery expecting or hoping to sell them? Not necessarily. I just pretty much want to reach the community of doll collectors, to let them know, “Hey, I’m making dolls, come to my site.” And maybe one day I’ll get it nailed down, where I’m really cranking them out as much as I’d like to, so I can start selling them. I’m still willing to sell them. Have you sold any from the show? Not that I know of — they’ll usually let you know a couple of days afterwards, but being that they’re appointment-only, it’s most likely not. The most sales they’ll do is opening night. Your dolls in the show cost about $400 to $500 each. How did you decide how to set the prices for them? Pretty much just watching what other dollmakers put their prices at for certain dolls that they have. And I’ll say, oh, that doll is kind of the same size or maybe has the same kind of stuff going on, depending — because some dolls, they’re using animal skulls and other crazy stuff, and that’s not cheap. So I know not to put my prices in that type of price range. And a flower. How much did that cost you to make? It’s nothing. I was buying the clay at maybe $10 a package, but now I have like 15 packages I got at a bulk price for maybe $70, something ridiculous. If anything, I’m paying more for the clay than for anything else, which isn’t really that much now since I got it so cheap. The fabric, it depends. I’m kind of a hoarder now. When I do go into fabric stores — I’m not buying yards, it’s maybe one yard, because my dolls are really small, about 15 inches, so you can get by. Per doll, [it costs] maybe about $10 to make it. You’re really charging more for the time that you’re putting into it. And you said the gallery takes a cut of any sales? Depending on what gallery you’re in. That gallery in particular, they’re taking 50% off the top. Every gallery’s different. Another gallery that I had in Long Island City was 35%. The galleries, they pretty much do whatever they want. Then there was another gallery in Greenpoint, they didn’t take a cut but they wanted $5 per piece that you put in the show. So you had to pay upfront? Yeah, some galleries, they want money upfront. The one in Long Island City, even after they want 35% of your sale, they actually wanted $100 [upfront]. Plus $100, because it’s for “promotional fees,” for them making flyers and stuff like that. I did it at first, because I was like, well, I want to put my dolls in a gallery, but now I’m not paying upfront anymore to be in a gallery. It’s just crazy. The gallery percentage — that’s understandable, because they need to have the gallery open, they have to make money somehow and not just have your stuff for free. They still have to pay for rent and everything else. At MF Gallery, if you don’t sell anything, do they get anything from you? Will you have paid them anything for displaying your doll? No. Galleries, the ones that I’ve dealt with, they haven’t asked for anything like, “Oh, you didn’t sell, you owe us this.” They haven’t done that, but you do have some of the galleries ask you for something upfront, which is a little shady, and you shouldn’t do it. But a lot of times it’s kind of hard to get into a gallery when you’ve never been in one. It’s almost like you’re trying to get a job but you don’t have the experience yet. … Once you put it on your resume, “I’ve been in this gallery, that gallery,” it kind of opened up the door for me to get into a different gallery — a better gallery. One that doesn’t need funding from the artists right away. Will those galleries take anyone who pays or is there still a selection process? No, there’s still a selection process. I wanted to ask you about Etsy. You’ve sold some doll magnets and other accessories there — do you like using it? I like it in terms of, they don’t charge that much. They take maybe 2.5% of your sales. The storefront’s free, and you get to list an item for four months for 20 cents; that’s compared to eBay, where you spend like a dollar, depending on how many photos you’re using, for a week. So that’s like me having five Etsy items for four months compared to one item for a week. So yeah, their prices are really good. And then eBay wants 10% off the top of whatever you’re selling. And Etsy’s 2.5% or 2.7%, something really low. I like Etsy in that sense, but people don’t find you on Etsy. They’re trying to make it better, doing search optimization, and now Google’s picking up the store, but I still don’t think that people are finding people on Etsy. … Etsy also has certain people that they favor, and they’ll have certain sellers that they put on their home page all the time. They’re supposedly rotating, but I’m like, no, this person was up there with this same item two months ago, you’re not rotating. And do you sell your crafts on eBay? At one time I was. But a dollar a week, it’s kind of steep. And then they want 10% on top of whatever you sell. And then PayPal wants a percentage, so it’s like I’m pretty much giving stuff away. I didn’t really sell any dolls on eBay — I also decorate hats, I was selling a lot of random stuff like that. And when I did post a doll, it didn’t sell. So you’ve said a couple of times that you’re not in it for the money right now. What’s your end goal? Do you want to get to a point where you’re, as you said, cranking them out and selling them at a profit? I would definitely like to do that. Now it’s just more that I need time. I’m not going to quit my day job for it because we don’t know where this is going yet. Especially now, I don’t have a solid plan or focus or, “Oh, I have to use this material because of this.” I don’t know anything off the bat right now. I don’t know what’s really working and what’s not. Are you getting feedback from anyone in particular or do you have any mentors who are helping you figure out what’s working and what’s not? A lot of my friends on Facebook, they became my friends because I would ask them questions like, “Hey, I see this doll moves like this, or I see you did this with a doll, how did you do that?” They’re really good at giving back feedback and information and saying, “Oh, you shouldn’t do this, you should do that.” They’re really good at giving advice. And a couple of them I actually met. The first time I went to MF Gallery, I met two dollmakers there. And that’s how I got into a show in Canada, because I actually met the person that owns that gallery. How much time do you spend on every doll? It depends. It’s pretty much whatever time I can get. A lot of times I’ll stay up till maybe two o’clock in the morning, adding hair onto a doll. It really depends. There have been times when a doll’s been laying around for about three months, because today it has legs, and that’s about it. And maybe next week I’ll get back to it and paint a face on it. …. A lot of times I’m up working till two, three o’clock in the morning. Do you work after your day job or do you wait until the weekends? Most of it’s at night. By the time I get home, it’s like eight o’clock, and after I do stuff around the house … then I’ll come out and say, ok, I guess I’ll do a doll tonight, and I’ll do maybe three aspects of it. I could sit up and do a doll straight through, but you know, it’s not good for you. I’d be up till seven o’clock in the morning. I guess I could finish a doll in one day, but it never happens. Do you ever think about going part time, or doing a part-time day job? I think about it all the time. But I need to pay my bills. It’s like, do I want to keep my apartment or do I want to play around with dolls? I’d love to play around, but I can’t. Maria Aspan is the national editor for American Banker. She writes about movies, science fiction and bad Jane Austen covers on her blog.